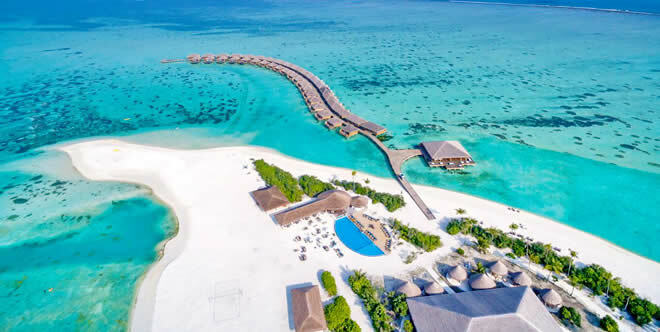 Fairmont Maldives, Sirru Fen Fushi is a new luxury resort with a delirious mix of substantial villas, large private pools and cool open spaces of the Secret Water Island. Situated in the Shaviyani Atoll, a seaplane hop from Malé, Fairmont Maldives offers the ultimate in privacy and tranquillity, your own sanctuary within a sanctuary for couples or families alike. 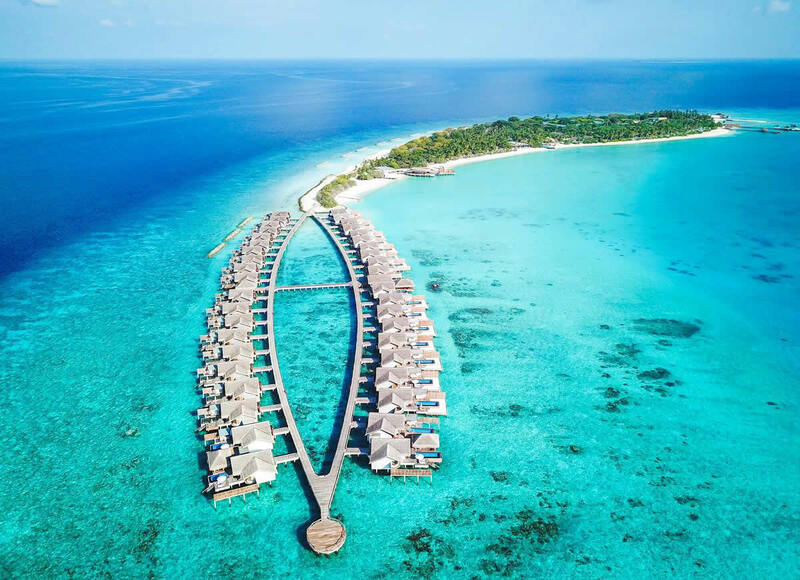 Part of AccorHotels, the stunning Fairmont Maldives Sirru Fen Fushi has opened in april 2018. Set on an exceptionally lush island bursting with flora and fauna the sophisticated 5-star resort offers luxury beach and over-water accommodation overlooking an endless turquoise sea each with a private pool and butler service. The picturesque locale is also surrounded by powder with diamond white beaches and jewel-like coral reefs. The all-villa resort features one of the largest lagoons in the Maldives, a 200-metre long swimming pool which traverses the length of the island, fine dining options, dive and water sports center, reinvigorating destination spa and an intricate open-air bamboo bar created by Balinese artisans who did not use any human-made materials in the structure as well as luxury safari-style tented villas nestled in the islands lush interior jungle. 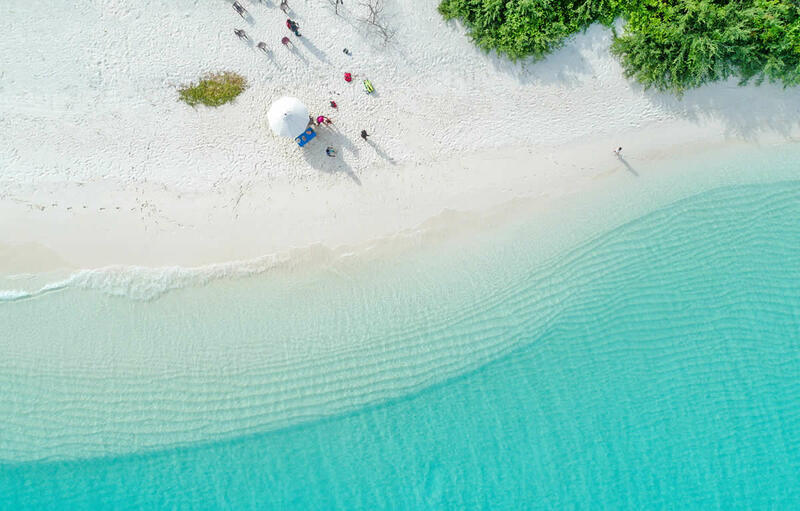 Accessible by a 50-minute scenic seaplane jorney from Male airport, the resort offers the ultimate Maldivian experience of turquoise and azure waters and fine white beaches, complemented by tranquil settings. 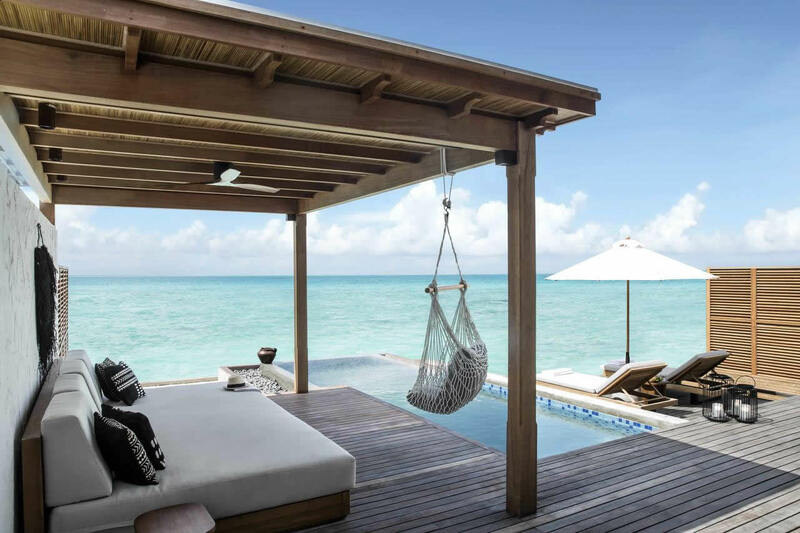 Discover new meanings of paradise and luxurious seclusion at this unforgettable Maldives resort. With posh the island vibe —both in terms of the nature and of the accommodations - epic horizon views overlooking natural lagoons with pale blue water rich in sea life and swims in newly discovered reefs is what awaits you here. The island measures in at just over one kilometre long and 600-metres across; essentially, it's just about big enough for guests to get lost on. Walk, buggy or bicycle between immaculate white beaches, the 200-metre-long swimming pool, the fitness centre, art and photography studios and the temple-like Willow Stream Spa. This a newest resort with top notch gym, spa, art studio, kids club, beautiful long olympic size pool with palm trees and underwater art, and beautiful beachside and over water dining options. Throughout the resort, still and sparkling water produced by the resort's desalinisation process are served in the Fairmont-branded glass bottles for guests' ease of consumption. High speed Wifi is available in the villa as well as the main areas. A great for barefoot holiday, wide vanilla beaches loop the entire length of the island, licked by ripples of bright blue water, and there's a quietly imaginative air about this hushed tropical island, with its secret gardens, swirling wooden structures and sculptural furnishings. 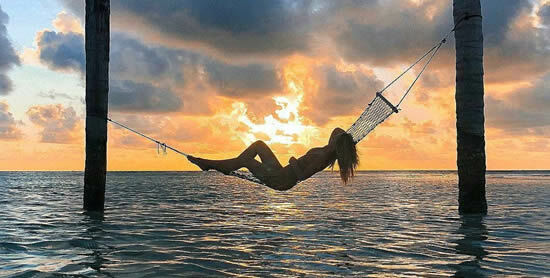 In terms of swimming and beach-wise the sunset side is definitely a better choice and our recommendation. The sunrise area is a wonderful option and its closer to the house reef. On the sunrise side there also are sea walls to protect from erosion and it seems that in some places there are rocks in the water. Vegetation on most parts is already lush, and you'll find that the beach villas provide good privacy. Fairmont Maldives Sirru Fen Fushi is the sole hotel on the pristine atoll, and its previously untouched location has allowed marine life to flourish, with manta rays, turtles, large pods of bottlenose dolphins and spinner dolphins regular visitors in the crystal-clear waters of the 600-hectare lagoon. The nine-kilometre-long house reef, directly accessible from the beach, is home to vibrant corals and a thriving ecosystem teeming with life. Uniquely, a manta ray cleaning station at the house reef, offers guests a rare close and extended glimpse of one of the world's most majestic marine creatures, many of which drop by in a beautiful display of aquatic symbiosis with smaller sea life. The surrounding turquoise and clear waters are rich in reef fish – neon-blue trumpetfish, stunning orange clownfish (Nemos), stripy red triggerfish – as well as spotted eagle rays, reef sharks and more. However, the resort's showpiece was always going to be its other-worldly sub-aquatic gallery, created by British artist Jason Declaires Taylor – an endeavour interrupted by the outgoing government's objections to the use of human-like figures. With a your-wish-is-our-command attitude an amazing staff are on their toes from the moment you stepping on the island to the moment you leave. Always there at the right time, checking up on you, if you need anything, making reservations and suggestions, even taking care of kids while you eat. This is more than 5 stars service. The butlers are so attentive, nice, and genuinely concerned for yo during your stay. The guests are a mix of ages and nationalities, some honeymooners, some families and the people you can see are mostly from the Europe, Russia, America and Asia. There are two ways to reach the island form Velana International airport (VIA). The seaplane transfer takes 55 mins with an alternate route possible via domestic flight to Hanimaadhoo airport. Seaplane: a jorney over a stunning marine seascape awaits you before touching down directly at Sirru Fen Fushi. Prior to take off you can relax in the seaplane's elegant lounge at the terminal for drinks and fresh pastries. 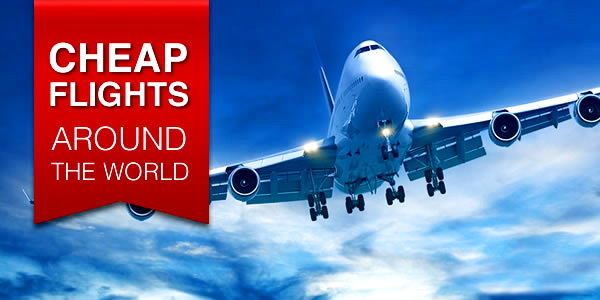 Round trip transfers prices starts from USD 594 per adult and USD 356 per child. Domestic flights on Maldivian Airlines are available to Hanimadhoo followed by a 50 minutes speedboat transfer to the resort. The speedboat transfer service operates 24 hours and can accommodate early morning and late evening flights. 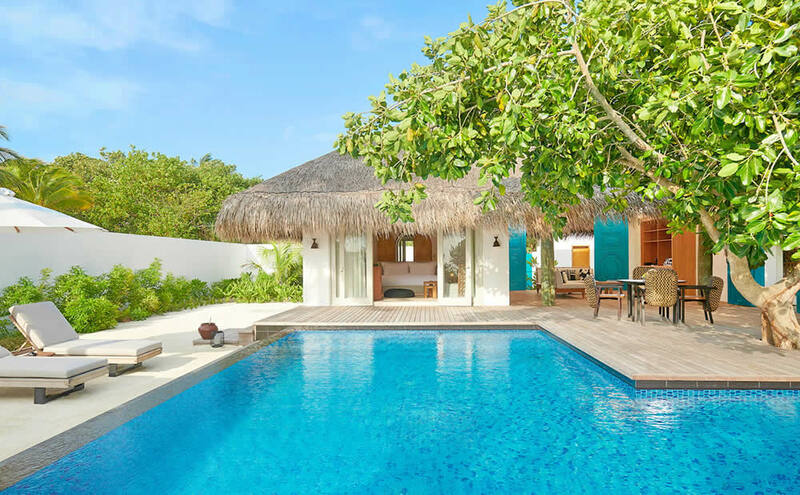 Sirru Fen's 120 villas have a chic, understated Maldivian look; Situated on one of the largest lagoons in the archipelago, these impressive retreats are built right on the powdery sands or directly over the turquoise waters. Choose from striking over-water villas, with sand decks wrapped around huge infinity pools; rambling big beach villas with sensual indoor/outdoor bathrooms at the rear and plunge pools out front; or safari-style tents hidden in the island's jungly heart. With 12 room categories a sleek, stylish and modern, the villas at Fairmont Maldives - Sirru Fen Fushi are about as luxe as they come. Not to be outdone by the natural beauty all around, the villas here boast traditionally inspired décor and all the high-end extras you could imagine. They're decked out with champagne woods, coral-shaped crochet rugs, rope and glass bauble chandeliers, and black and white macramé cushions. Copper bathroom fittings and carved wood detailing on furniture lend the villas a bohemian rustic chic vibe. Private pools are available in all villas, letting you cool off in style just steps away from your door. All villas are categorised based on the island’s stunning topography, and include Beach Villas, Water Villas, and Tented Jungle Villas. Specially adapted to the Maldives, the unique tented jungle villas offer privacy and a romantic castaway vibe; other guests can also experience the verdant island interiors with glamping BBQs or jungle cinema. 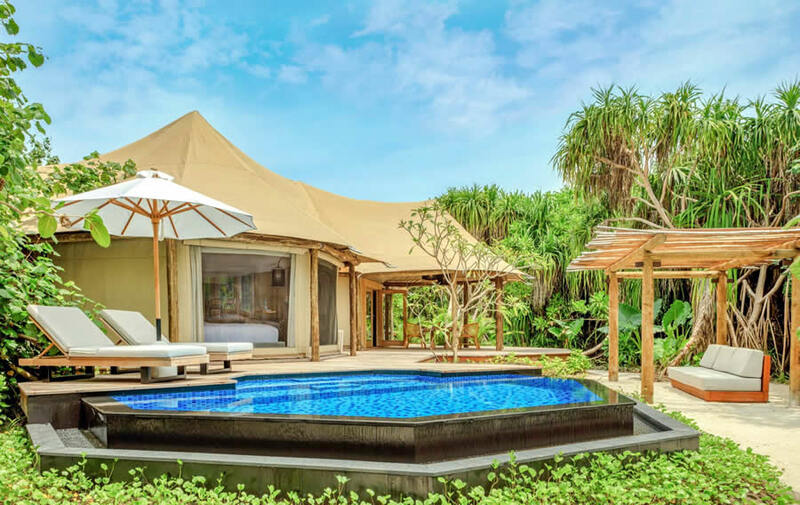 An ideal accommodation option for adventure-seeking families or groups, five Jungle Tented Villas (525 sqm) lie hidden in Fairmont Maldives Sirru Fen Fushi’s lush inland jungle. A truly memorable alternative to overwater lodging, the Tented Villas hidden within thick foliage and provide safari-style outdoor living the luxurious way. New shades of green await here, which bring Maldivian wilderness to your doorstep. The décor of all of the villas is quite similar with lots of light woods and woven accents, though the bathtubs are the true stars here. Designed by South African luxury tent specialists, Bushtec Safari, the Tented Villas are built to mirror the beauty and diversity of the island’s flora and fauna, with wooden frames, amber-toned interiors and white-canvas walls. The indoor and outdoor spaces are nearly indistinguishable, with alfresco lounge space and bathing facilities, allowing travellers to get even closer to nature. A harmonious balance of seclusion, the Tented Jungle Villa offers acres of space with a master bedroom featuring an outdoor private bathrooms with separate shower, double sink, a Nespresso coffee machine, wine fridge, Bose Hi-Fi system and a California King-size bed. There is also a separate children’s bedroom area plus a glorious outdoor with a 95 sqm deck centre piece and private swimming pool nestled into the tropical Maldivian jungle. And, if there’s anything you need just call your personal butler who is on standby 24-hours a day. The downside of the tents - there is no own stretch of beach, the guests have to use the beach area at the Onu bar. A unique Maldivian experience for honeymooners, explorers and families alike, guests staying in Fairmont Maldives Sirru Fen Fushi’s beach or overwater accommodation offerings can still enjoy a luxury jungle experience. For film aficionados, private cinema screenings in the Tented Villa can be arranged, screening cult classics and blockbusters under the stars. Gourmands can head out to sea for a sunrise fishing trip and learn the art of Maldivian line fishing, before feasting on their fresh seafood with a private safari BBQ. Couples and honeymooners can book private spa treatments, while families can enjoy a rustic glamping experience with bonfire and entertainment – just for them. Divided into sunrise and sunset the beach villas have sandy walkways leading to each villa, complete with a private plunge pool, hammock, and daybed in the back. The Sunrise Villas are ideal for early-risers, offering a sun-kissed start to each day. If you like house reef snorkeling take the Sunrise Villas that're close to the reef. The beach villas allow for direct access to the beach within steps of walking. The architect and design team has thought of everything in designing the villa, there is so much space that you can happily spend an afternoon in the villa swimming in thу pool or relaxing on one of the two oversized sofas outside. The rooms are amazingly built with attention to detail. With California king-size beds and relaxation salas, the rooms have constantly replenished fruit baskets, which sounds pretty standard—except that the fruit is tropical and divine. The bed is aligned to the sea, so you wake up with an incredible sea view. High-speed free internet and great selection of recently released movies to enjoy if needed. The Beach Sunset Villa is luxurious as well as functional and perfect for a family of 4. The villas are very spacious and have an outside shower and bathtube in front of the house in a green oasis. The outside bathroom is particularly impressive and the quality of the finishes throughout are second to none. And with trees planted strategically they allow for much privacy to the adjacent rooms... it's as if each of the rooms has their own private beach front where you can just walk into the water, and start snorkeling every morning. Deluxe Beach Sunset Villa is really fabulous. Very nice garden area with daybed, sun loungers, cabana, hammock and a good-sized pool. Huge indoor bathroom, wardrobe, separate living room, lush outdoor bathroom. A dedicated Villa Host is available 24 hours a day and takes pride in making your stay as comfortable as possible, simply give them a ring and start exploring our secret water island. For the deepest of relaxation and full of privacy, consider the Water Sunrise Villas (164 sqm), which sit above the gentle waves of the Indian Ocean. 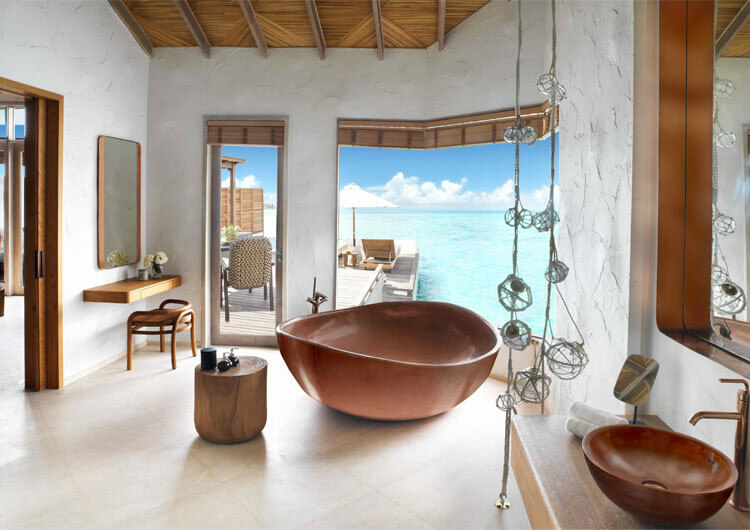 The Water Villas are even more impressive where you have the large bath tub, while indoor, sitting behind the large glass window for a direct view to the ocean. 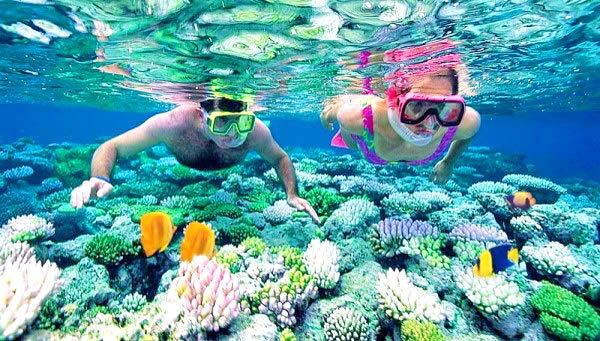 The snorkeling area is amply full with sea creatures for beginning to intermediate snorkelers. The villas are large, clean, comfortable and super luxurious. The design has really been thought about and complimented the location.These villa varieties feature oversize copper bathtubs, en suite indoor bathrooms and great powerful shower, relaxation decks and salas, reasonably sized plunge pools, and more. There are a copper freestanding bathtub and a glass panel in the toilet so you can watch fish swim by while on the throne. Outside there are also 2 sun beds, another larger sun bed underneath cover, a table with 2 chairs and a hammock swing. The private pool becomes the perfect place to enjoy the view while not having to enter the waving sea water. 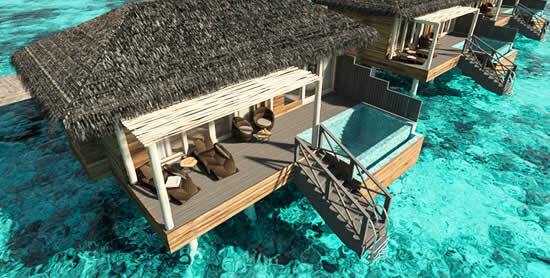 The over water villas are equipped with a small manmade sandbox and a ladder that dives directly into the ocean, making them perfect for anyone who wants to jump right in to crystal clear water with great opportunities to snorkel in the middle part of the water villas jetty (large variety of coral and fish). We recommend to stay at Grand Water Sunset Villa (235 sqm). WOW - Quite simply world class! The pictures you see on the website, although are magnificent, cannot capture the real beauty of the rooms. The décor manages the fine balance between elegant and island-style: think textured walls, crochet rugs and ottomans, hanging lanterns, cushions with fringed covers and floral motifs carved into wooden closet doors. They are spacious, luxurious, crisp white towels and linen, great big beach towels, a huge and very comfortable bath with an unparalleled view! A big private infinity pool, hammock and plenty of lounging areas! The lagoon-facing deck is expansive with an unusually, a private sand box so you get your own beach.The rooms are elegant and every detail is considered. Expect a good snorkelling every morning. There are many colorful fish right nearby sundeck including stingrays and reef sharks. The resort's snorkel gear is a quality and free. 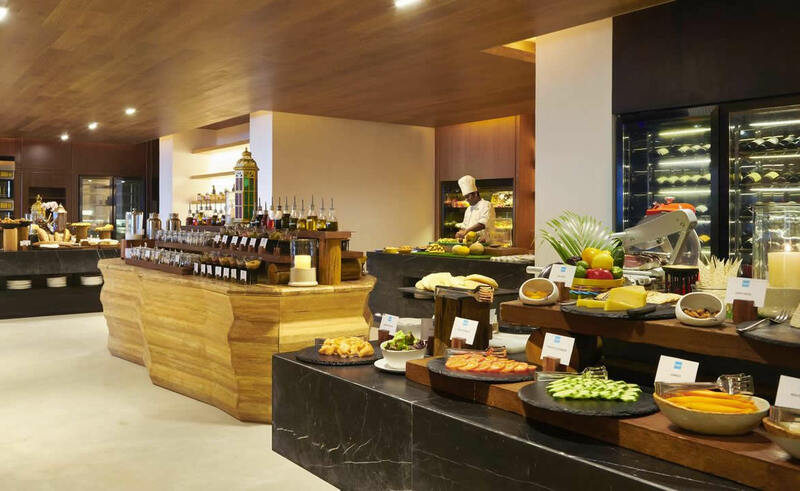 The resort's main dining hub, Raha Market is the buffet restaurant and a veritable marketplace of aromas and flavors serving Maldivian specialties, multiple Asian cuisines and healthy gourmet meals all day long. Breakfast can be as angelic – papaya, lime and chia smoothies, mushroom and ricotta bruschetta – or as devilish – frothy cappuccinos, pancakes filled with cherries, pastry with mousseline cream – as you wish. Evenings are often themed, so it might be Chinese, Indian or beach-barbecue night – the latter best enjoyed at a table with your toes in the sand. The Maldivian fish curry has just the right hit of spice. There's also a wood-fired pizza oven. The food is all quite impressive and flavorful, particularly the fresh fish, but fair warning: main courses are rather pricey. Adjacent to the main all-day dining restaurant, the intimate Raha Market Bar is a relaxed space for aperitifs or digestifs to round off a meal at the water’s edge. Olivier, the head chef makes the buffet at Raha Market something exceptional. The produce he sources will blow your mind- there is a cabinet with cold meats and cheeses from all over the world. The breakfast pastries are amazing. Each night at the Raha market they will showcase something special- the barbecued local grouper fish will stay in your memory. Nadidje the chef will also make hand-made pasta and there will be different themes every night eg, local cuisine, middle-eastern cuisine- it is all amazing! Michael and Barry the managers make a special effort to talk to the guests.The only con's of the hotel - the expensive of the food and drinks. The buffet for dinner is $90 USD if you are only on B&B which we think is slightly too expensive. The in room dining menu is slightly more reasonably priced. Drawing on the culinary riches of the seas for a fine-dining experience, the food at Azure is terrific - great selection of sea food and land meats to choose from and all very fresh (the squid, Maldivian tuna, lobster squid ink linguini and the crustacean bisque are all worth recommending). The creative seafood menu is paired to fine wines, fresh ocean breezes, and stunning views of the Indian Ocean. Also, and crucially, the staff here led by Jeffrey and Greg are superb - not only do they understand what 5 star service means, they delivered it impeccably with every interaction. With pan-Asian flavours and stunning waterfront design the resort's signature Japanese restaurant & bar Kata, celebrates sophisticated pan-Asian flavors with a modern menu that offers an array of Japanese-style tapas, Robatayaki grill, and Maldivian-influenced creations. Kata also serves a selection of Japanese Kaiseki set menu dinners along with fresh sushi and sashimi. Meanwhile, the rooftop lounge sets a dramatic stage for sumptuous sunsets and truly indelible moments with an innovative cocktail menu, a rare whisky list and a curated sake selection. The striking all-bamboo Onu Onu poolside bar is the thrumming social heart of the resort, where a selection of legendary cocktails and light bites mingle with gorgeous views of the prime beachfront while the infi nite cerulean lagoon beckons from beyond. Onu Onu Bar is also the great spot to enjoy dessert after dinner social hours. Live music combined with theatrical fire displays create a fascinating ambience and perfect memories. Twinkling candles, a laidback soundtrack and comfortable sandy beach seating make it the ideal place to wind down after a busy day of exploring. Destination dining experiences draw guests further into nature with private meals enjoyed under the stars and powder-soft sand beneath the toes. With a tailored selection of facilities suitable for families and children at the resort, the whole family will find an especially warm welcome here. There's Toddler's play garden and shallow pools for toddlers, food menu and a kids' club for four to 12-year-olds. The place is fantastic, your children will love all the activities that they do daily, ranging from coconut painting, shell necklace making, master chef, ginger bread house competitions, painting, wood art, henna tattoos, and just playing with the amazing team. There is a huge slide from second floor to the ground and there a net trampoline on the second floor! 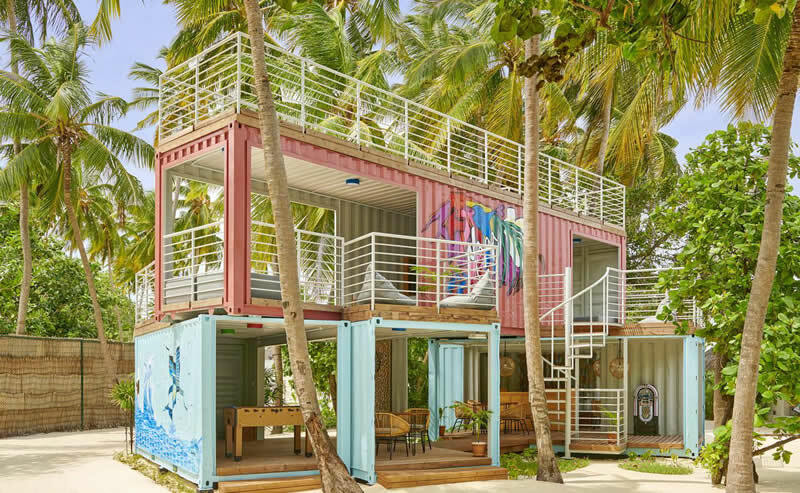 There's even a teenagers' hangout, made up of stacked shipping containers, with pool tables, video games and its own DJ soundtrack offering a wealth of exciting experiences for young adults. The resort also has an Art Studio, great for the little ones. Elegant and wonderfully proportioned, the rustic chic Two Bedroom Beach Sunset Villas offers bounteous amounts of space ideal for families. Located on the edge of the perfect white sands, amid lush tropical gardens, the Two Bedroom Beach Sunset Villas feature two en-suite private bathrooms with separate shower, double sink, a Nespresso coffee machine, wine fridge, Bose Hi-Fi system, California King-size beds, large open plan separate living spaces and a dining room table. Outside enjoy a private outdoor bathroom with a bathtub and shower, a gorgeous 48 sqm swimming pool, a sala for relaxing and dining and if there’s anything you need just call your personal Villa Host who is on standby 24-hours a day, simply give them a ring and start exploring the secret water island. One of the most northern atolls, Shaviyani remains relatively unknown and un-explored. Explore vibrant reefs and hope to encounter schools of batfish, eagle rays, marble rays and guitar sharks among a variety of marine life. Vibrant reefs are filled with colorful reef fishes, sharks, and corals. There is a Secret Shark Point where along the pinnacle divers will spot some grey reef sharks and schools of large fishes. Don’t miss Lupo Thila dive site – a small reef filled with large coral formations and many reef fishes. Shaviyani Atoll in the north of the Maldives was selected as the resort’s base because of its unspoilt marine environment and 9km of reef – complete with several manta ray cleaning stations. Professional water sports outfitter Sub Oceanic runs PADI courses, guided fun dives and snorkelling expeditions, during which you can glimpse blackback butterflyfish, blue triggerfish and several species of unicorn fish cavorting in the coral. Flo who heads up the diving centre is too always welcoming, knew the guest by name and make a fuss of you every time you visited them. All their dive equipment are brand new. House reef ia amazing. And its not bleached unlike a lot of other resorts in the south. Several options here, at the water bungalow which is teeming with life and great for snorkelling, or out near the Spa area. From manta, eagle eay, stingray, octopuses, lots to see! From night fishing and house reef snorkeling to anti-gravity air yoga with a personal yoga trainer, to a jungle cinema, to a fantastic teenager activity center the resort has it all. This is the Maldives, so water-based activities abound. Kayaking, stand-up paddle boarding, water ski, tube rides and snorkelling, of course. And there's a sunset dolphin cruise in a traditional Maldivian dhoni to spot wild spinner dolphins leaping and, yes, spinning in the air as they race to keep up with the boat. 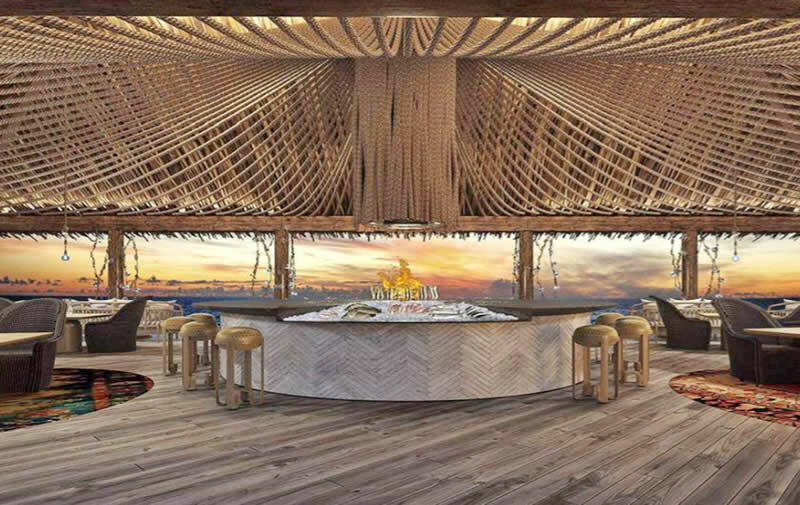 Fairmont Maldives Sirru Fen Fushi is also poised to bring the essence of its secret water island location to life with experiences that bring guests closer to nature. Guests can plant coconut trees on the island, or by participate in coral restoration efforts and turtle release programmes. By Fairmont's tradition, there's a Willow Stream Spa on the island, done up in soothing white tones with light wood details. It’s the same tranquil natural surroundings from which the spa draws its energy and vitality. 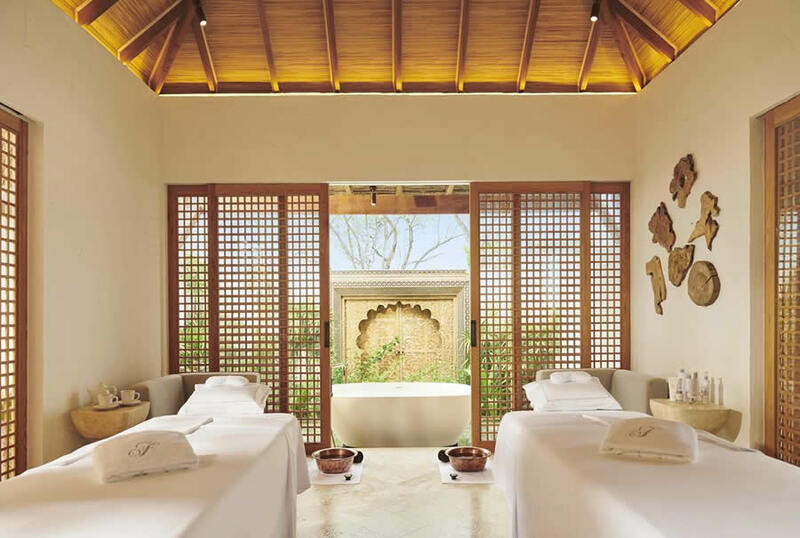 The Willow Stream Spa offers a wellness experience that rivals others, offering carefully curated treatments that embody the island life – a serene retreat for the mind, body and soul. The architectural design features hand-carved wooden doors, with sea breeze passages designed to draw fresh sea air into the treatment rooms. The treatment rooms have a hint of Japanese style to them, with sliding doors reminiscent of shoji screens. The 2,000 sqm wellness area is adapted to Maldivian island chic in its concepts with the use of endemic herbs and Indian Ocean-inspired treatments. A 60-minute destress massage does just that, with ylang ylang oil that I'm told “aids with contouring”. A dedicated Olympic size Jacuzzi pool is provided for spa guests for pre or post treatment immersion. SPA - we suggest sticking with Tini or Yonda. They are class above the rest. Book early is our suggestion. Reviews for Fairmont Maldives, Sirru Fen Fushi are very positive, with the luxury all pool villas and intimate setting being a major plus. The service, which includes your own butler, mostly gets very high marks, though some do report some delays or confusion, which seems natural at some point for any resort. There are also a few that say the butler service was the only service that was attentive, though only a few feel this way. The food gets very good reviews as well, though some say the atmosphere in the lounge could be improved upon. 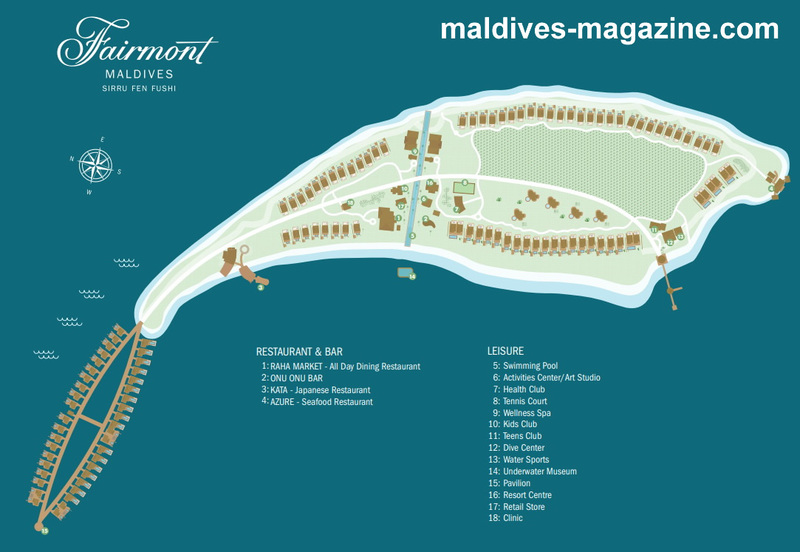 Overall this appears to be a good choice among newest 5-star overwater villa resorts in the Maldives. A great butler service. The staff is friendly and helpful. The spacious and modern pool villas, built on the powdery sands or directly over the water. 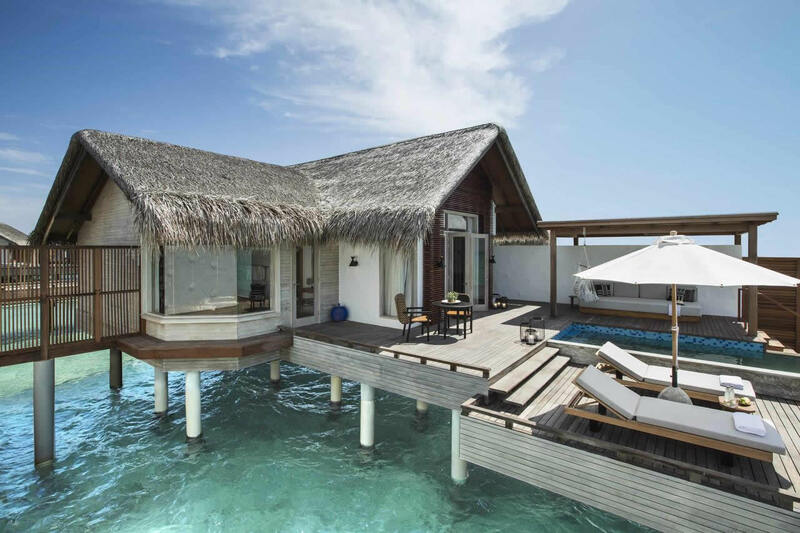 Water Villas come with a fantastic sea views. 50 minute by sea plane ride from Malé airport. Could be more if there are stops on the way. All Children are welcome. One child under 12 years stays free of charge when using existing beds. There is a doctor on site is available 24 hours and offers basic medication and treatments free of charge. 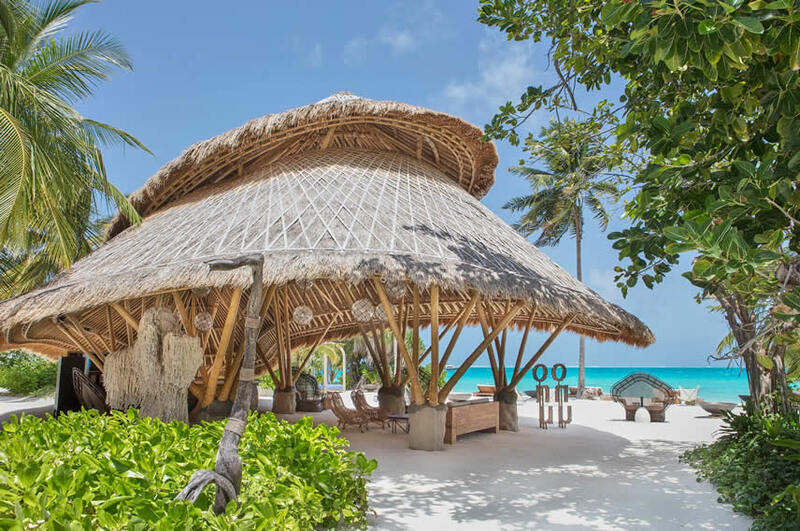 Fairmont Maldives Sirru Fen Fushi has been named the leading luxury new resort in Indian Ocean 2018.